Günstiger Slicker mit harten Pins auf der einen und weichen Pins auf der anderen Seite. Die Größe L ist ideal für größere Flächen. Für doppelschichtiges Fell zum leichten Entfilzen geeignet. 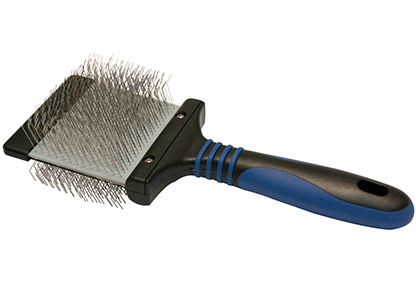 Show Tech Twin-Flex slicker brushes are specially designed to make brushing easier, more efficient and to prevent pain to the animal. Unique design features hard and soft pads in the same tool to save you time. The soft pad has long, strong pins to reach deep down into the coat. Turn the brush through 180¡ and you have a hard pad with long, firm pins to make short work of mats and difficult coats. With its ergonomic, comfortable handle and flexible head, the Twin-Flex guarantees a minimum of stress on hand and wrist while maximizing efficient mat removal...Every groomer should have one! Available in 2 sizes. Long coats - Gently brush with a light, long stroke, brushing beyond the ends of the hair tip to avoid static and breakage. For best results brush the hair in layers. Start at the bottom by parting the coat horizontally and holding the un-brushed portion up with your free hand. Work methodically upwards, keeping your wrist straight to avoid contact with the dogs skin. Curly coats - Brush in the direction of coat growth and then against it using light, long strokes. 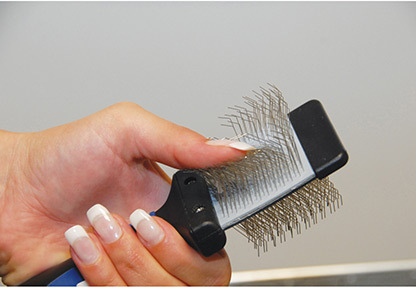 Harsh coats - Brush the coat in the direction of coat growth then against if necessary to remove mats and dead hair. If the coat is matted, use Twin Flex Slicker brush in combination with dematting-spray. To prevent mats and tangles, the dog's coat should be regularly bathed, treated with a conditioner and brushed daily.